Nissan JUKE Pros and Cons | Page 1 of 1 | Why Not This Car? What drives people to buy (or not buy) a certain car? TrueDelta's members share Nissan JUKE pros and cons based on their real-world driving experiences. Fun to drive sporty little car. I love the variety of driving "modes." I can get in, and choose how I want to drive that day. FWD, AWD-auto, full AWD; sporty/eco/balanced; manual or auto shift. The amount of control you have over the performance is amazing. Very unique styling. I get head turns all the time and have even been stopped at red lights and gas stations to receive compliments on my car. It is an awesome experience. Inexpensive to fill up, still not bad when you spring for the premium it recommends, an ideal trip car. First road trip it averaged 25.2mpg, driven with a lead foot. 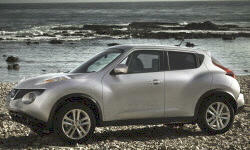 The more the Juke is driven the better the milage seems to get. Firm with minimal body roll and the ride is not rough because of its long suspension travel (higher ground clearance). Slip-sensing AWD mode helps grip in snow. Torque vectoring AWD mode fights under steer on pavement and is similar to systems like S-AWC.